What mobile devices are compatible with the Daily Nanny app? How do I reset my password? How much does Daily Nanny cost? Is the data about my children secure? How do I let my wife/husband/mother-in-law get notifications and see photos? Can I add multiple nannies? How do I add another child? How do I change the notifications I receive? Can I pick what events I want to receive push notifications about? Why aren't I receiving notifications? How do I send messages to my Nanny? Can I save the photos added to the account directly to my phone? Can I make a comment on a photo? How do I edit or delete an event? 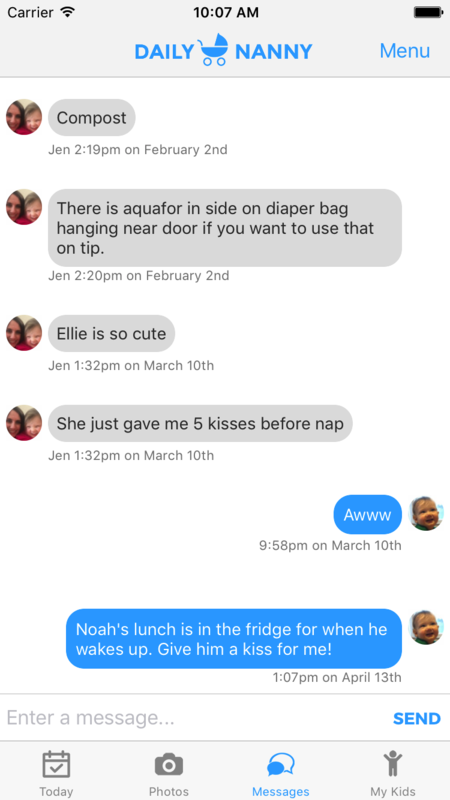 How do I add an event (note, nap, meal, bottle/nursed, diaper/potty, medicine, incident)? What will I see when I open the App? How does my nanny track his/her hours? Can I go back in time to view Messages, Activities and Photos? What mobile devices are compatible with the Daily Nanny app? Any iOS device (iPhone, iPad, iPod) that is running iOS 8.0 or later, and any Android device running Android 4.0 or later. Within the App, tap Menu, select Change Password, and you will be prompted accordingly to change it. Should you forget your password, simply visit dailynannyapp.com, click log in and reset it there. For security purposes, you will be emailed instructions and a code to reset your password. How much does Daily Nanny cost? Daily Nanny costs $4.99 to install on your iOS or Android device. Every member of your care team needs to pay this one time fee, this helps us pay for the services that keep it running! This charge includes all app features, and up to 250 photos uploaded per child. 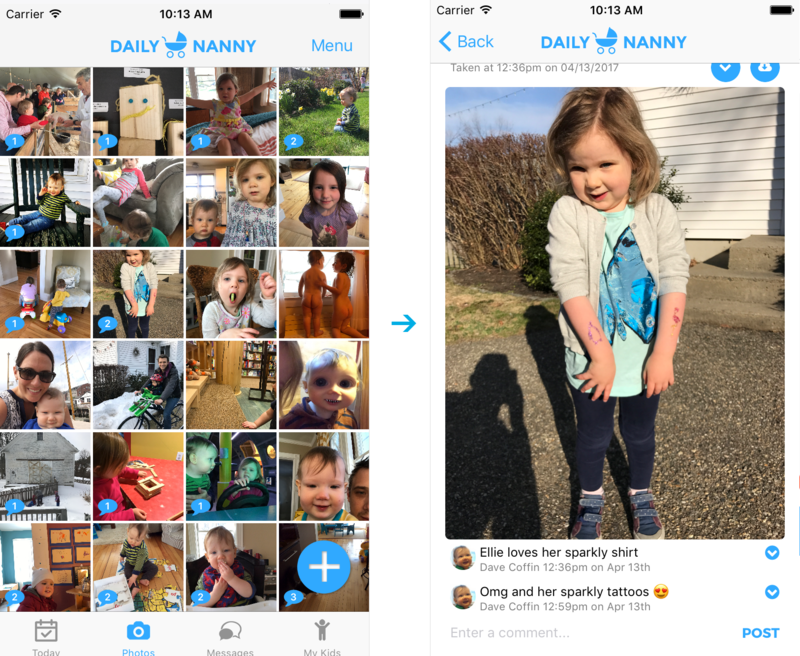 Once you have uploaded 250 photos, you will need to sign up for a Daily Nanny Hero plan, which is $3.99/mo and includes expedited customer service and unlimited photo storage. Is the data about my children secure? Absolutely. Daily Nanny continuously strives to maintain the highest security protocols possible. Our web application is served under SSL (TLS), which is a protocol that provides privacy and security between the client (you or your nanny), and the server (where we store your data). All the data going back and forth is encrypted using this protocol, the most common security measure in the world of internet privacy. You can read more about TLS and SSL here. How do I let my wife/husband/mother-in-law get notifications and see photos? 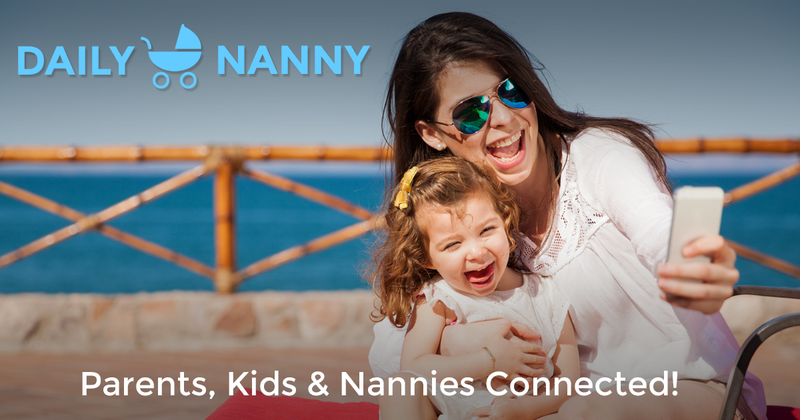 You can add any individual you choose to your Daily Nanny account – your mom, your partner, your best friend, etc. Tap My Kids, then tap on the child you would like to add a member to. 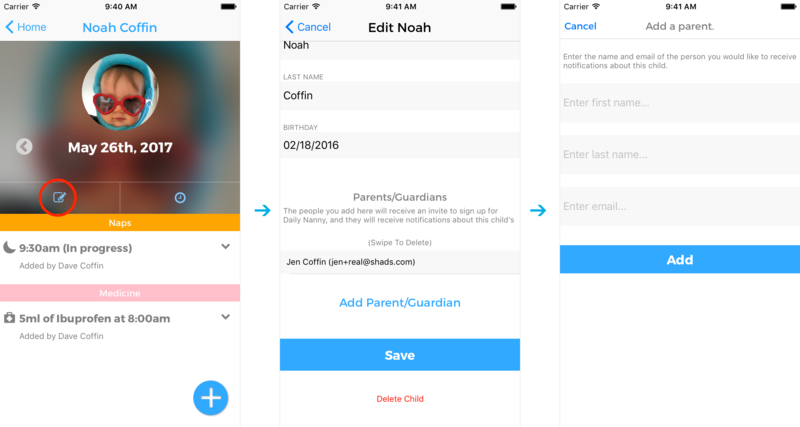 Tap the edit icon and then tap Add Parent/Guardian. Can I add multiple nannies? No, at this time, Daily Nanny is designed to work with only one nanny per account. How do I add another child? Tap My Kids tab, select Add a Child, and follow the instructions! How do I change the notifications I receive? Can I pick what events I want to receive push notifications about? Within the App, tap Menu, select Notifications, then you can select and turn on and off what notifications you wish to receive. Notification settings are unique to individual accounts, so other account members and your nanny can customize their own notification preferences. Why aren't I receiving notifications? 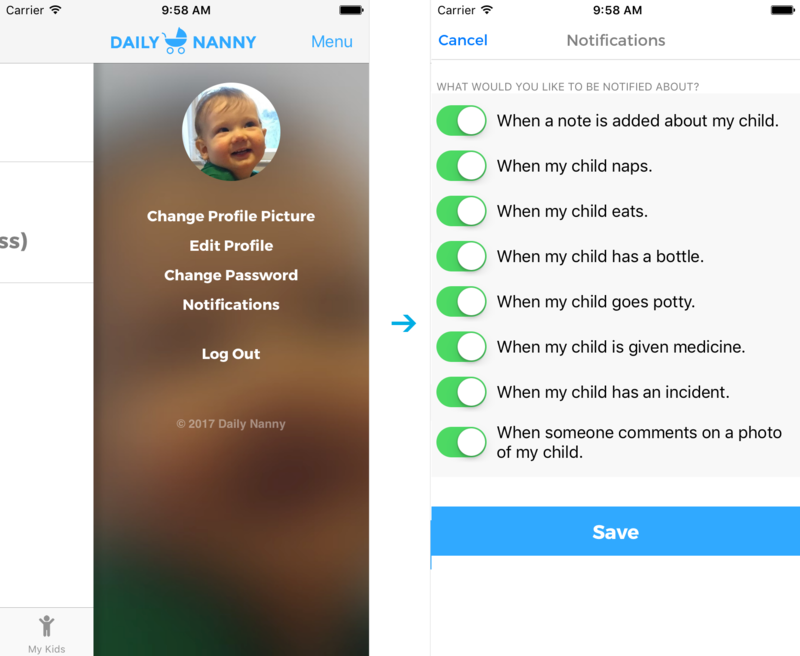 This could be a setting within the Daily Nanny App (see the above question), or it could be the settings on your device regarding notifications. Sometimes, people accidentally disallow notifications when they first open the app. 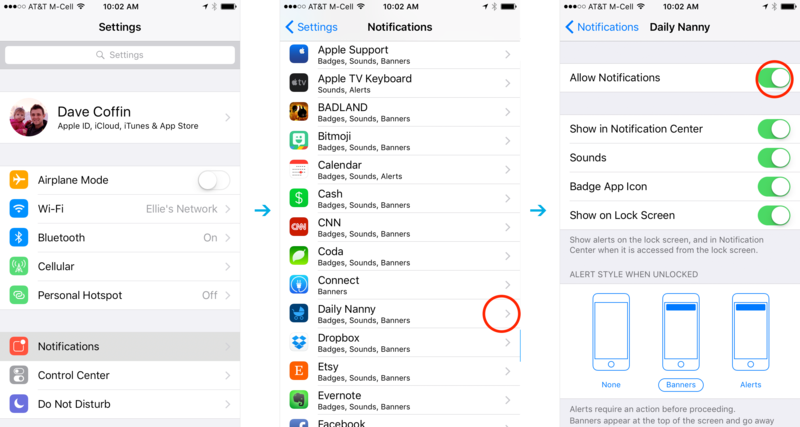 To enable notifications on a per app basis, go to your home screen and open Settings. Tap Notifications, find Daily Nanny in the list and tap it, then make sure Allow Notifications is set to ON. How do I send messages to my Nanny? Anyone can send messages within the account, and these messages are accessible to all account members, all in one place. Depending on individual settings, account members will also receive notifications of new messages. When a message is sent within the App, it begins a thread to the entire user group within the account, and are distinguished by the message sender in a message string just like a group text thread. Can I save the photos added to the account directly to my phone? Yes, when you are viewing a photo within the App, photos appear in a grid format. Simply tap on the desired photo and select the Download icon in the upper right corner of the photo screen, and it will automatically be saved to your device storage. Can I make a comment on a photo? Anyone in the account can comment on individual photos. 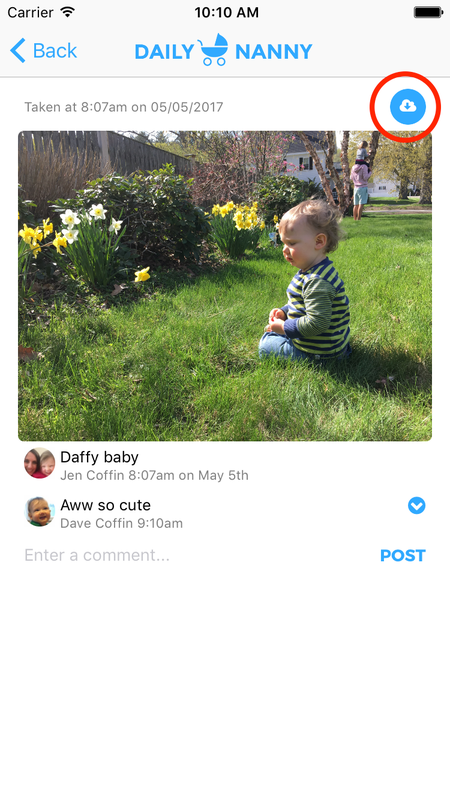 When users are looking at the photos in Grid view, comments are indicated by a chat bubble at lower left of the photo with a number indicating the number of comments. When you tap on the individual photo, the comments appear beneath the photo. A child's events are categorized under each individual child within the My Kids tab. When you are in that child’s events listing, each event has a dropdown arrow to the far right where edit or delete can be selected. 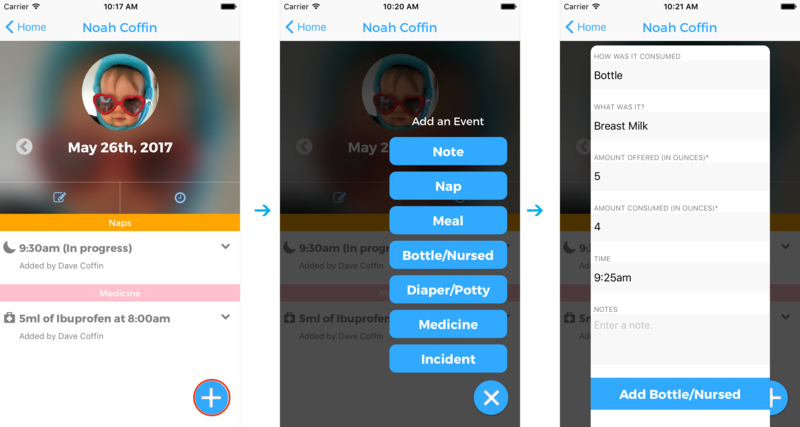 How do I add an event (note, nap, meal, bottle/nursed, diaper/potty, medicine, incident)? 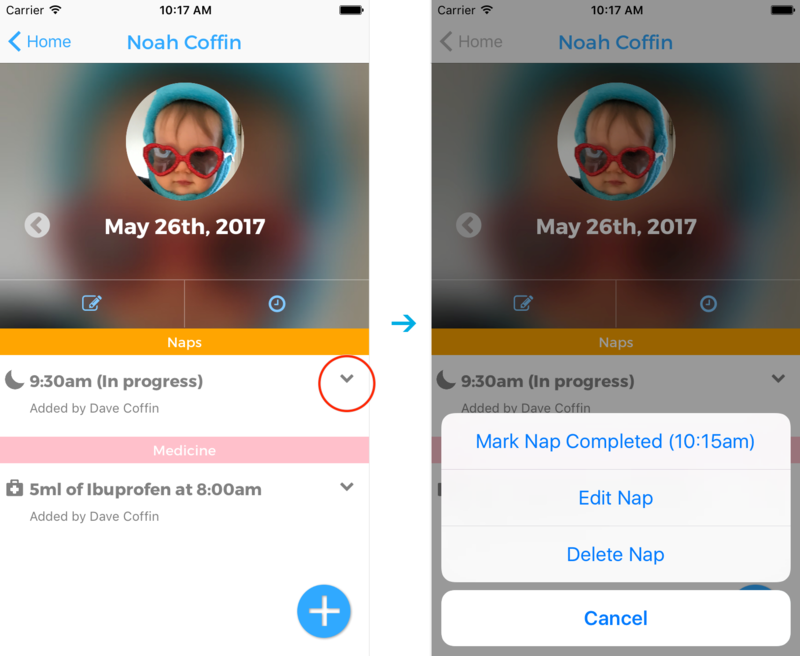 Within the My Kids tab, tap on the child, then tap on the + icon, choose what type of Event you want to add, and a form will pop up for you to complete (times for naps, type and quantity of food, etc.). Tap Add and it is saved to that child’s profile for all account members to see. What will I see when I open the App? Parents and Nannies have different Launch Views when they open the app. Parents see a running view of Today's activities and photos added during the current day. Parents essentially see a timeline of everything that has happened for each child within the account. 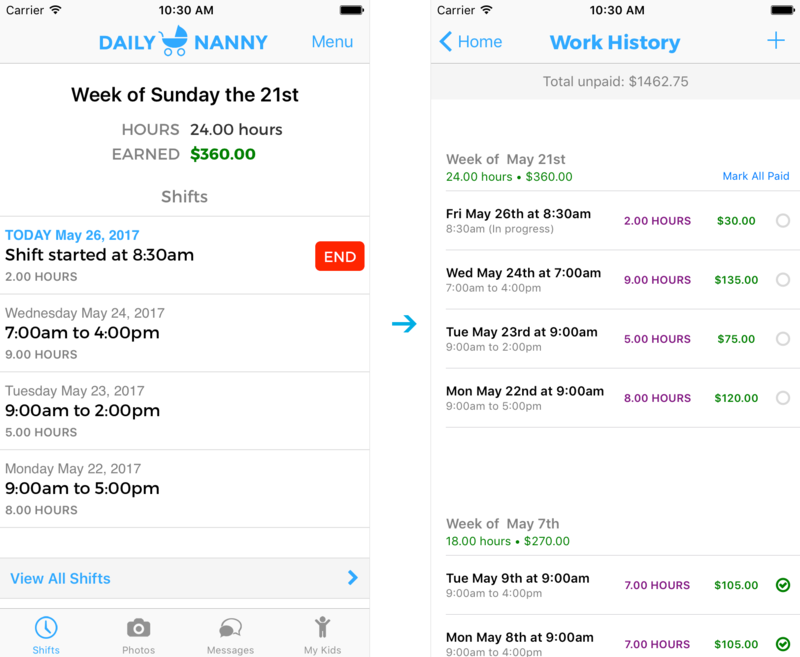 Nannies open the app to the Shifts area so they can clock in, and can see a running tally of their hours and amount owed. We do this so they will remember to clock in and manage their hours so accounting is streamlined. How does my nanny track his/her hours? When a Nanny opens the App they are brought to the Shift area so they can Start Shift and "clock in", or View/Manage Shifts. Our weeks are scheduled Sunday – Saturday, and the App maintains a running total of weekly hours, and total money due based on the customized hourly rate, including overtime, by the current week. 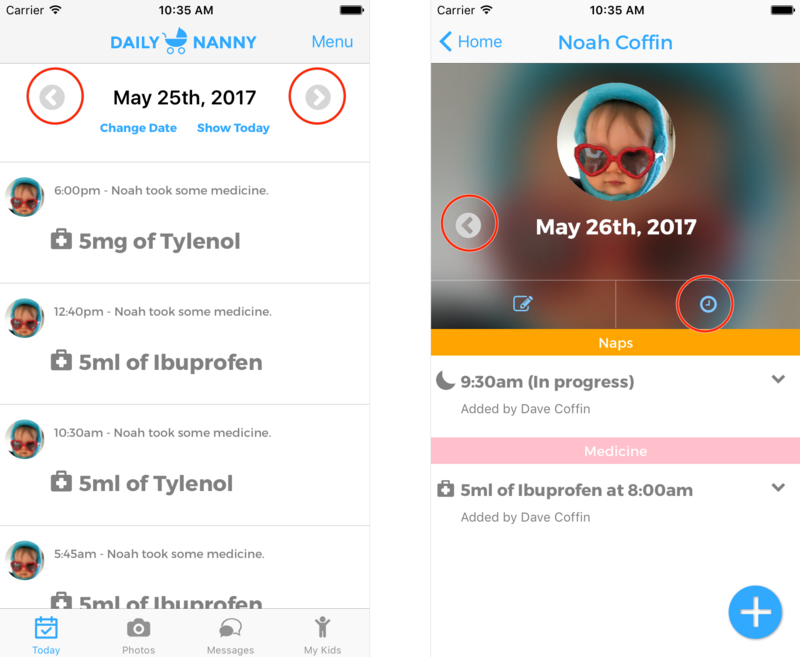 Nanny and Parents both have access to the Shift view, where hours can be added, edited, and amount paid can be marked to update the account. Once a payment is made, weeks can be marked as paid. Both Parents and Nannies can always see exactly how much is owed at the top of the manage shifts section. Can I go back in time to view Messages, Activities and Photos? Yes. At any time, you can tap back to any date in time in the past to review account information. When viewing the Today view, you can change the date or simply tap the left or right arrows to navigate through time. You can do the same thing while viewing an individual child's page.